From the very start of our Residency training, Emergency Medicine Physicians are tasked with committing to memory the correctable causes of PEA arrest. It is expected any intern worth their salt should be able to recite the H’s & T’s proselytized by the AHA as far back as 1995 (1). And yet, it quickly becomes evident that this strategy for the management of PEA arrest is not only unwieldy and impractical, but the evidentiary basis supporting its use is minimal. In fact, a brief perusal of the evidence supporting this AHA document reveals that there is none (1). The general assumption is that narrow-complex PEA is generally due to a mechanical problem frequently caused by right ventricular inflow or outflow obstruction, whereas wide-complex PEA is typically due to a metabolic problem or ischemia and left ventricular failure. Wide-complex PEA may also indicate agonal rhythm (2). The most robust evidentiary support for narrow complex rhythms representing a readily correctable cause of arrest, originates from a single paper published in 1992 in Chest by Paradis et al (3). This paper examines a cohort of 94 patients in PEA arrest. Using arterial catheters, the authors found that a portion of these patients had what they called pseudo-PEA, or a pulse demonstrated on arterial waveform that was not detected through direct palpation. 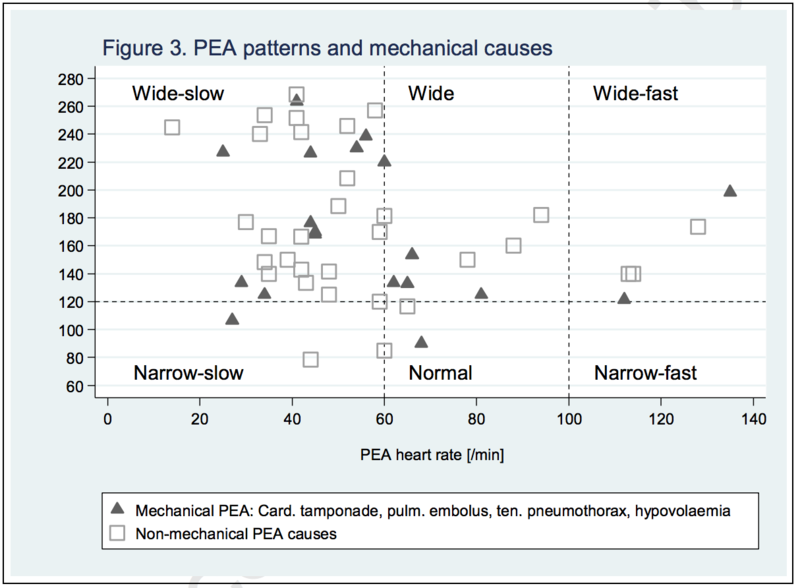 The authors cite that patients with pseudo-PEA were more likely to have a narrow QRS than those in true PEA arrest. And while the mean QRS width was significantly more narrow in patients in pseudo-PEA (0.12 vs 0.24 ms), the corresponding interquartile ranges varied too much (0.04-0.24 vs 0.11-0.56 ms) for this measurement to be used clinically. Furthermore, the authors did not investigate the specific etiologies responsible for patients’ presentations and how they related to QRS width. Although the authors cite that patients with narrow complex waveforms demonstrated significantly improved short-term outcomes and more frequently responded to pressor therapy (23% vs 77.8%) when compared to their wide-complex counterparts (35.9% Vs 14.5%), these differences did not translate into improvements in neurologically intact survival (3). 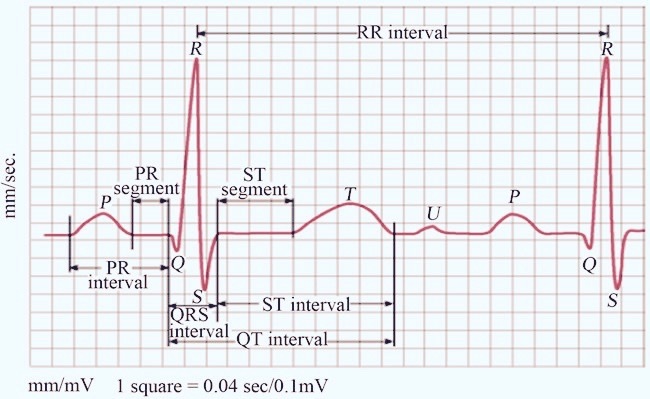 A recent article published in Resuscitation sought to directly examine the utility of QRS width in predicting the etiology of cardiac arrest (4). 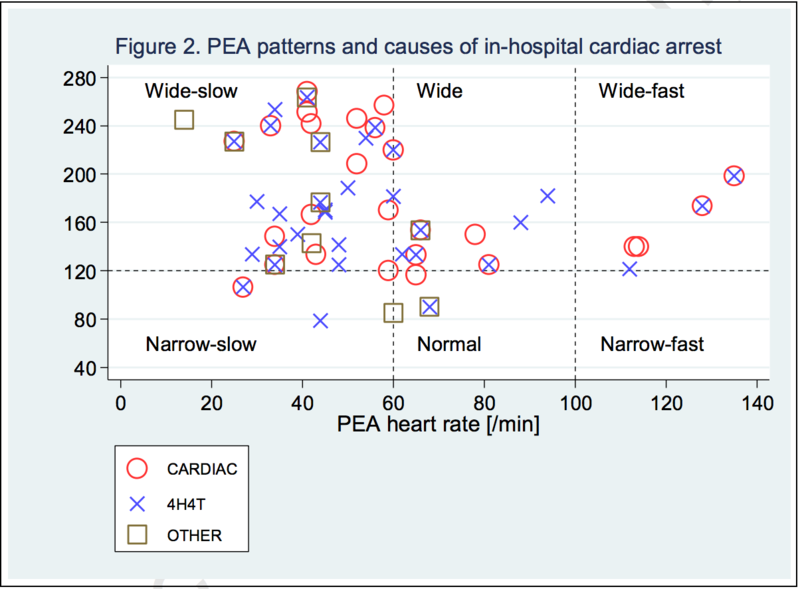 Published by Bergum et al, this was a prospective observational cohort examining patients experiencing in-hospital cardiac arrests (IHCA) with an initial rhythm determined to be PEA. The authors then focused on the subset of PEA patients in whom they could establish a definitive cause of their arrest. Using this cohort and the data garnered from the defibrillator waveform analysis during the resuscitation, the authors examined the predictive value of the EKG pattern to predict the underlying cause of the arrest. Over a 4-year period, the authors identified 144 patients who experienced an IHCA with an initial rhythm of PEA. Of these, 51 patients had a readily identifiable cause of their arrest. EKG criteria were measured independently by two electrophysiologists. The vast majority (90%, 46/51) of the EKGs analyzed were considered to be a wide-complex (width> 120 ms) and 63% (32/51) were considered bradycardic (<60 bpm). Only 6% (3/51) were considered normal. In brief no EKG criteria was predictive of either the etiology leading to the arrest or survival to hospital discharge. Of the 21 patients who achieved ROSC, the HR varied from 25 to 128 BPM and the QRS was anywhere from 79-264 ms. Similar variability was observed in the 6 patients who survived to hospital discharge. Fig 2 and fig 3 in the manuscript clearly illustrate there is no discernible association between QRS width and the etiology of arrest or likelihood of neurologically intact survival. width and cause of arrest that is hidden in statistical noise, but if it does exist this association is weak and erratic. This data should certainly cause us pause when considering the utility of the QRS complex in PEA arrest. Its use should be limited to determining if and when to administer treatments for hyperkalemia. PEA is so prognostically dismal because the majority of these arrests are due to an agonal rhythm (5). Caused by either severe cardiac dysfunction or more commonly a ventricular arrhythmia that, because of a prolonged downtime, spontaneously converted or was defibrillated into an agonal rhythm. As such the most reliable predictive utility of PEA in cardiac arrest is as a surrogate for a prolonged downtime. Despite this poor prognosis, a small number of these patients can have a good outcome if a correctable cause can be rapidly identified. The H’s and T’s proposed by the AHA is far too complex, unwieldy and based on little empiric evidence. The alternative strategy of using the QRS width to guide resuscitative efforts, though more straightforward, is based off an assumption that when empirically tested does not reliably predict causes or outcomes. Rather, a far simpler approach should be employed. One that does not focus on every possible cause for PEA arrest no matter how rare or ineffective our treatments are, but focuses on the few causes we can rapidly and effectively correct. These correctable causes are hypoxia, hypovolemia, tension pneumothorax, cardiac tamponade, and pseudo-PEA. Rather than using the EKG, which consistently fails to reliably differentiate these etiologies, the utilization of bedside ultrasound can quickly and accurately identify 4 of the 5 correctable causes while the rapid placement of an ETT will empirically account for the remainder. The Fog of War, was first coined by Prussian Military Analyst Carl Von Clausewitz to describe the uncertainty in combat. War is the realm of uncertainty; three quarters of the factors on which action in war is based are wrapped in a fog of greater or lesser uncertainty. A sensitive and discriminating judgment is called for; a skilled intelligence to scent out the truth. So too is the uncertainty we face when managing patients in cardiac arrest. Rarely are the cause, course and potential solutions conveniently laid out in a clear and concise fashion. We are forced to use clinical surrogates as beacons to assist in navigating this uncertain course. It behooves us to select clinical tools that are both reliable and accurate. Such is the skilled intelligence to scent out the truth. Littmann et al. A Simplified and Structured Teaching Tool for the Evaluation and Management of Pulseless Electrical Activity. Med Princ Pract 2014; 23: 1 – 6.